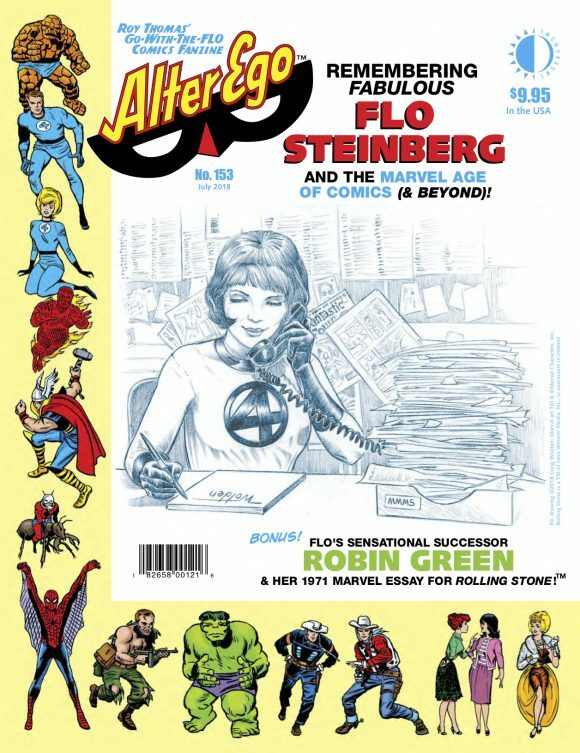 Alter Ego #153 is out 6/13 from TwoMorrows and editor Roy Thomas has put together a wide-ranging tribute to Fabulous Flo Steinberg, the cult figure who made her name as Stan Lee’s “gal Friday” when the Marvel Age exploded in the 1960s. It’s a wonderful package of features and homages, and the issue even includes the 1971 Rolling Stone article about Marvel, in which Steinberg was prominent. I was particularly taken with the personal tributes written by comics pros like Trina Robbins, Denny O’Neil, Larry Hama and Marv Wolfman. Stan Lee once remarked that Flo Steinberg was a little ray of sunshine, and that’s how I choose to think of her. From the moment she stepped back into the Bullpen 20 or so years ago, she became a surrogate den mother to the assortment of crackpots, degenerates, and ne’er- do-wells that make up Marvel’s editorial and production team. 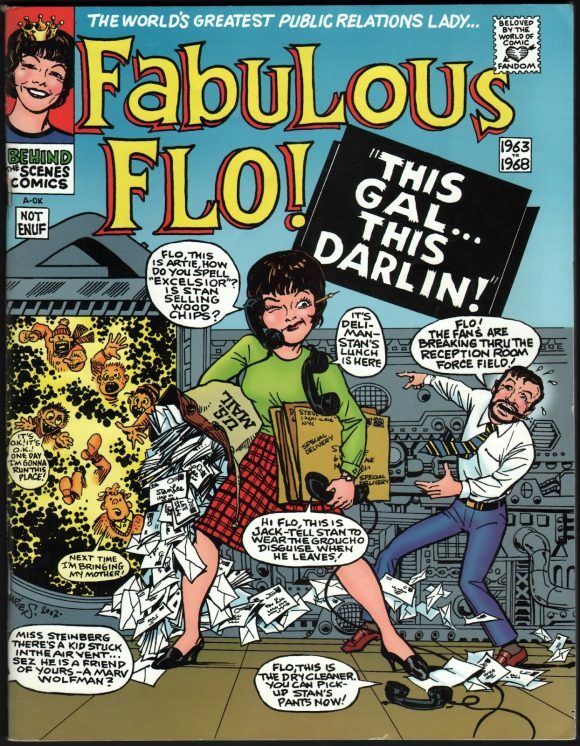 Flo didn’t care that most of those young newcomers had no idea of her tenure in the industry; that she’d worked as Stan’s “gal Friday” in the formative days of Marvel; that she was, at least visually, the inspiration for Betty Brant. That she had followed Wally Wood around, ashtray in hand, to keep him from trailing ashes all over Stan’s office, and that she had answered all of the fan mail for years, sending a young Walt Simonson the Thor issue that he had missed and ensuring that he’d eventually work for the company. That’s because Flo wasn’t a comic book person, not really. Oh, she knew all of the characters, had been there when most of them were just starting out. But that part was just a job. What Flo really was is a comic-book people person. For whatever reason, she found simpatico spirits in all of the nuts and goofballs and social misfits that make up the comic-book industry, and she had good feelings for pretty much all of them—with the exception of the cruel and the craven, for whom she had little use. She became a mentor and a mother-confessor to whole generations of young professionals, some of whom would go on to make an extraordinary mark on the field, and some who’d exit the business thereafter but carry Flo’s lessons along with her in life. She was a sharp proofreader who regularly decried the lack of spelling and grammar skills among the younger generations. If you were any good at either, Flo loved you, and if you weren’t any good at either, Flo knew exactly who you were as well. Flo had the most wonderful New England accent, so distinctive that it was easy to develop a passable impression of it. And so, many of us (all right, mostly me) delighted in doing impressions of Flo saying the most foul-mouthed and inappropriate things. But the real joke here wasn’t simply that Flo was too much of a well-bred lady to ever say such things. It was more that, especially given her days among the counterculture, it was entirely likely that she was capable of saying all of those things and more. Flo had little tolerance for fools of any kind, and there was steel at the center of that tiny frame. She gave me a mountain of things over the years. 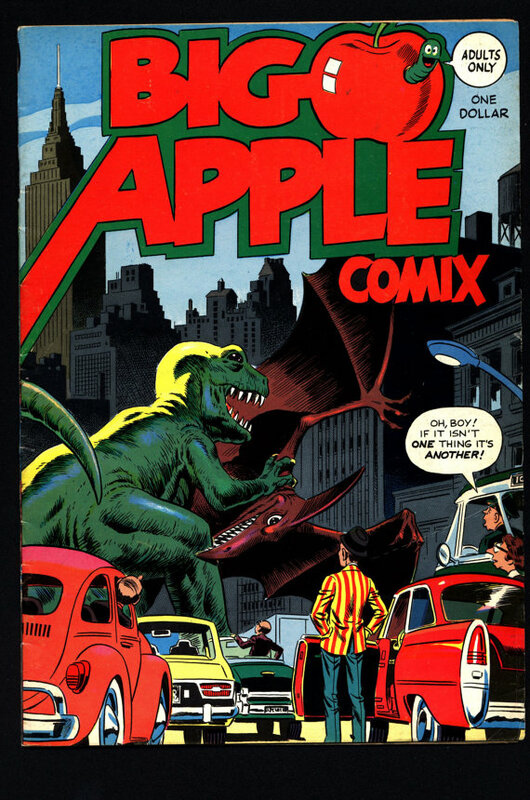 I own two copies of Big Apple Comix, the underground comic that Flo published, one that I bought and another that she gave to me. Learning that my son had developed an interest in World War II, she gave me stacks of books on the conflict to pass along to him. And I was not alone in receiving this bounty of the bizarre—everybody who was around Flo for any length of time got something—and there was still enough left over that it could be gifted out as party favors during Flo’s memorial at (Manhattan’s) Society of Illustrators, organized by Larry Hama and her longtime friend Linda Fite. Flo didn’t really like the spotlight, got tired of answering all of the same questions about the glory days of the Marvel Age of Comics early on. (“You know, it was just a job.”) This carried over to her personal life. She was a very private person. So, for the most part, nobody at Marvel knew how ill she had become until it was all over. Which makes me sad, that she had to face the end largely on her own. She was so beloved that it was completely unnecessary. But that was Flo, never wanting to inconvenience people, never wanting to put anyone out. And completely self-sufficient. About a week after we had heard that she was gone, my old assistant Gregg Schigiel, who had been Flo’s neighbor, sent me over a clip of a message that Flo had left him on his answering machine. She mentioned that she was going to be going in to Marvel that coming week, and then said something nice about me. It was like one last little glimmer of sunshine as the evening grew dim. Alter Ego #153 is out 6/13. You can get it at your local comics shop or directly from publisher TwoMorrows. Click here. This.. is wonderful. Lovely. What a sweet tribute, and so beautifully simply expressed. And I will be picking up this issue, now that I know. I came to own the Comic Book Artist#18, and adored it above all for its loving tribute to her. I was 10-11-12 years old in the mid-Marvel 1960s. I didn’t know her, but I, we, felt as if we did. There she was, on the MMMS soft, red, bendy record, her voice, and helpingStan lee along with the corny introductions; or in a grainy black and white photograph, with the other artists and staff. Just Flo. But..we knew. Somehow we knew. She was the one, getting our Marvel Stationery mailed to us, intact; or our six- foot+ high Ditko Spiderman poster, in that giant mailing tube, out to us. And all else. She was our link to the magical kingdom of Marvel, out there on Madison Avenue,NY,NY 10022, so wonderfully mystically far away. She was our sister, or Mom. How I’ve come to learn so much more about her, since her death. Fabulous Flo Steinberg. Our Flo. A sweet bridge to our past. So, here’s to her, and to the sunny slopes of long ago. Over here in England, I felt the same. 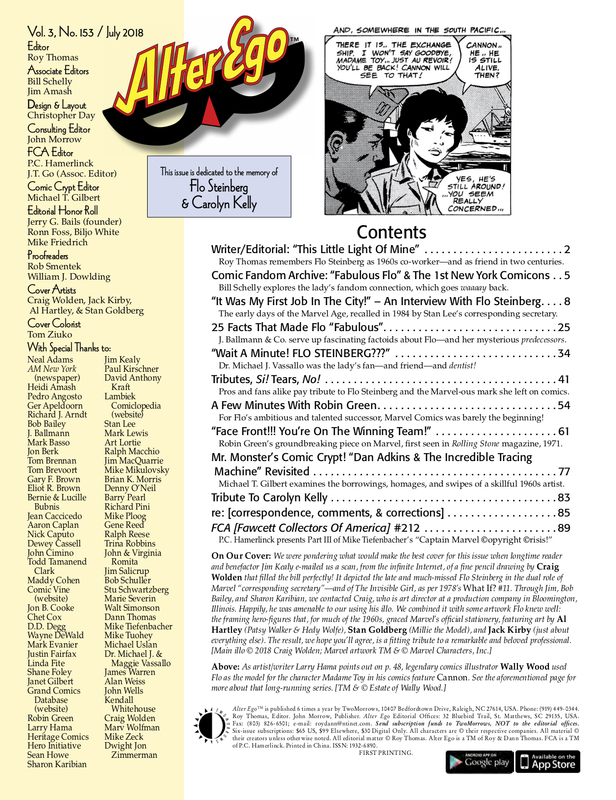 I couldn’t stop the tears when I heard at my comic shop that she had passed away, again when I got the Alter Ego tribute issue, and reading the tribute here also got me tearing. How many lives did she touch? !